Tanyana has the innate talent to manipulate the very particles that hold matter together, as one of the most skilled pionners in a far-future society she can craft almost anything with just her concentration. An accident however brings her whole life crashing down and she is virtually cast out of the society she knew, becoming little more than a rubbish collector, tidying up after those gifted creators who were once her sub-ordinates. But was this really an accident or could there be some sinister purpose to all this? Her quest to find out will take her to parts of the city she never knew existed, and open the door to a world she could never have imagined. Debris sets you up for the fall right from the word go, no lengthy exposition or reflective world building just straight for the jugular and then picking up the pieces afterwards. This approach has both advantages and drawbacks, as the reader doesn't have any prior knowledge of the world or characters it does present a way of learning as the protagonist does, which helps set the pace, however as there has been no time invested in the character there is little emotional attachment and as a result the accident has less impact than it would otherwise. I do like this opening though and the author makes it work quite well, although it does mean you really have to pay attention or lose some vital pieces of information. 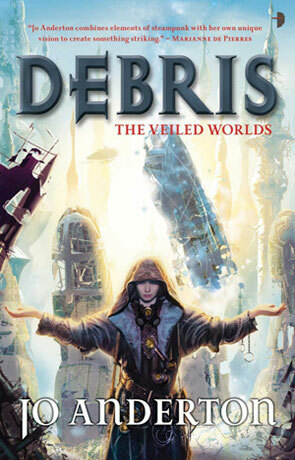 I did enjoy living within this very richly (if minimally) crafted world that the author presents in Debris and the magical system is not only pretty unique but such a great idea too, in part reminding me of Brandon Sanderson's sprites. I also loved the way that the author played with the protagonist, a strong female lead who get's her life completely turned upside down and thrust into a world she knows nothing about - the fallen heroine who must struggle in a dark and dangerous place to find her new way in the world is just great. It is also a great vehicle for the reader to learn more about the world and storyline and this is done by a minimal amount of exposition. Written in the first person the dialogue is snappy and clever with a fastidious attention to detail, which creates a really crisp and vivid picture of the people, places and situations. The supporting cast are very colourful (Lad is just brilliant) - adding a lot of depth to the story. I loved the dark, dystopian feel to the whole novel, the hints that there is something very wrong with her society are just great while the story itself is fast and keeps you pretty much hooked until the end. It is however clear that this novel is intended to be a part of a series and there are many more questions raised than answers given. Debris is another illustrious offering by those Angry Robots, an accomplished novel by an adept author. Written on 5th October 2011 by Ant.